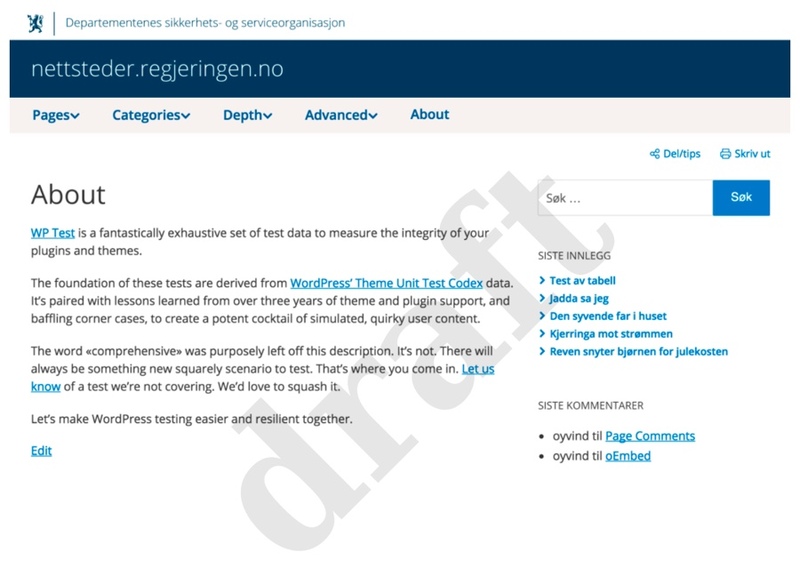 At work we're developing a new WordPress theme. The theme "depends" on a few plugins. We are adding the plugins using the TGM Plugin Activation library. 'dismissable'  => false,                    // If false, a user cannot dismiss the nag message. 'dismiss_msg'  => sprintf('<h3>%s</h3><p>%s</p>',$current_theme->Name, $current_theme->Description),                 // If 'dismissable' is false, this message will be output at top of nag. 'is_automatic' => true,                   // Automatically activate plugins after installation or not. 'message'      => sprintf('<h3>%s</h3><p>%s</p>',$current_theme->Name, $current_theme->Description),                     // Message to output right before the plugins table. 'notice_can_install_required'     => _n_noop( 'This theme requires the following plugin: %1$s. ', 'This theme requires the following plugins: %1$s.' , 'tgmpa' ), // %1$s = plugin name(s). 'notice_can_install_recommended'  => _n_noop( 'This theme recommends the following plugin: %1$s. ', 'This theme recommends the following plugins: %1$s. ', 'tgmpa'  ), // %1$s = plugin name(s). 'notice_cannot_install'           => _n_noop( 'Sorry, but you do not have the correct permissions to install the %s plugin. Contact the administrator of this site for help on getting the plugin installed. ', 'Sorry, but you do not have the correct permissions to install the %s plugins. Contact the administrator of this site for help on getting the plugins installed. ', 'tgmpa'  ), // %1$s = plugin name(s). 'notice_can_activate_required'    => _n_noop( 'The following required plugin is currently inactive: %1$s. ', 'The following required plugins are currently inactive: %1$s. ', 'tgmpa'  ), // %1$s = plugin name(s). 'notice_can_activate_recommended' => _n_noop( 'The following recommended plugin is currently inactive: %1$s. ', 'The following recommended plugins are currently inactive: %1$s. ', 'tgmpa'  ), // %1$s = plugin name(s). 'notice_cannot_activate'          => _n_noop( 'Sorry, but you do not have the correct permissions to activate the %s plugin. Contact the administrator of this site for help on getting the plugin activated. ', 'Sorry, but you do not have the correct permissions to activate the %s plugins. Contact the administrator of this site for help on getting the plugins activated. ', 'tgmpa'  ), // %1$s = plugin name(s). 'notice_ask_to_update'            => _n_noop( 'The following plugin needs to be updated to its latest version to ensure maximum compatibility with this theme: %1$s. ', 'The following plugins need to be updated to their latest version to ensure maximum compatibility with this theme: %1$s. ', 'tgmpa'  ), // %1$s = plugin name(s). 'notice_cannot_update'            => _n_noop( 'Sorry, but you do not have the correct permissions to update the %s plugin. Contact the administrator of this site for help on getting the plugin updated. ', 'Sorry, but you do not have the correct permissions to update the %s plugins. Contact the administrator of this site for help on getting the plugins updated. ', 'tgmpa'  ), // %1$s = plugin name(s).